What makes any day different from the others? Why is it that some people have that moment of clarity when they realize they are DONE!? I believe there is no magic to this. I believe that there is, however, a moment when a person decides they no longer have to live the way they are living. Yes, many call it a spiritual awakening. Others call it a moment of clarity. Call it what you will, but I believe something switches in our thinking. Many of us suddenly realize where our life is headed, and we finally see that we can change the course. The despair we feel… the pit we are in… the dismal darkness… the gaping hole in our soul… We simply do not have to let the story end there. I remember back in middle school there was a popular series of books where the reader had the opportunity to choose his or her own ending. At the conclusion of each chapter, you were to make a choice about where you wanted the story to go. Each choice led to a different story line, and each of those story lines led to a unique final ending based on the choices made throughout. I thought that was pretty cool! This caused me to think about my own life. With the help of my Higher Power, I can look at my life at any point in time, and choose one of two things. I can either continue down one particular path, or I can make a decision to rewrite the ending to my story. I cannot do it alone… but I CAN do it. All it takes is complete and utter faith. Your post reminded me of the movie “Big Fish”, which I love and just watched for the umpteenth time last nite. It’s about the beauty and intricacies of storytelling–the stories we tell ourselves and others and the stories that actually happen. In the rooms, I’ve learned that I have control over my own story and no one else’s. 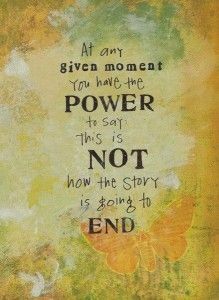 I can control whether my story is a positive or negative one but I cannot dictate what happens in the stories of others. I try to choose the positive each day, and it really is a conscious practice. Best wishes with your own story. I have never seen that movie. Guess I’ll have to check it out! Thank you so much for your comments!